Another kool kat design, approximately 24" high overall (including base). Hot pink neon cat with blue and green neon eyes. The neon tube 'plugs into' a black resin base, which houses the transformer, and has a line-cord on-off switch. This is a work of art, handmade by me here in Arizona, USA; everyone is slightly different, and comes with a Certificate of Authenticity. Shipping charge includes insurance. This piece is made to order, and ships in 1-2 weeks. Real neon tubes don't burn out like incandescent or fluorescent bulbs. With a minimum of care, this neon piece will last for many years. We warranty the neon tube for 5 years against burnout (excludes breakage). If you have any questions, or would like different colors, etc., please contact me. I have been making neon for over 30 years. Cool Cat Neon Tabletop Freestanding Hot Pink Design Original Modern Feline Illuminated Art Sculpture FREE SHIPPING! Cool Cat Neon Tabletop Freestanding Design Original Art Sculpture FREE SHIPPING!!! Scaredy Cat Halloween Freestanding Neon Art Sculpture FREE SHIPPING!!! 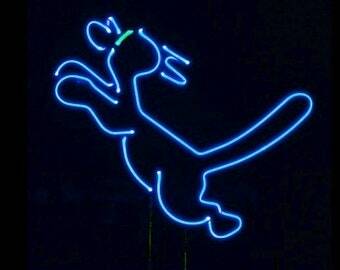 Hep Cat Neon Art Sculpture Feline FREE SHIPPING!!! Kosmo the Neon Cat Freestanding Modern Neon Art Sculpture Feline Neon Sign Light FREE SHIPPING! Blue Kat Neon Sculpture FREE SHIPPING! Lizard Freestanding Real Green Neon Tabletop Modern Illuminated Art Desert Sculpture Gecko Lamp FREE SHIPPING! 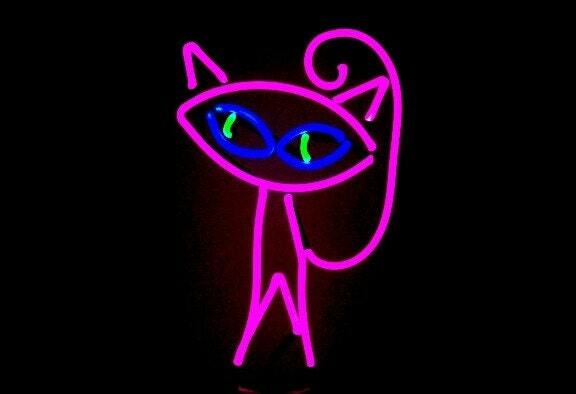 Pink Cat Real Neon Art Tabletop Freestanding Sculpture FREE SHIPPING!!! Googly Eyed Cat Real Neon Handmade Feline Wall Hanging Art Sculpture FREE SHIPPING! Blue Kat Freestanding Neon Art Tabletop Sculpture FREE SHIPPING!